It is maybe a truism, but we require regular, uninterrupted sleep – and children need it even more. The benefits of proper sleep in childhood are manifold: studies prove that sleep promotes the proliferation of growth hormones, protects children from vascular deficiencies, fends off weight gain, produces more infection-fighting proteins, increases active attention spans and boosts learning. Anything that disrupts sleep patterns can have a serious knock-on effect on your child’s health, well-being, and behaviour. Simply put, a sleep disorder is an ailment that either breaks up your child’s sleeping patterns or shortens them. A recent study estimated that 30% of all children suffer from a sleeping disorder at some point and there are a range of reasons as to why it happens. The vast majority of sleeping disorders are obvious to detect and usually as simple to remedy: more often than not, a child’s recommended sleep patterns are broken by external stresses or because their bedtime routine isn’t working for them. However, in many cases, the reason is related to breathing problems which is where a respiratory specialist can help. Around one in 10 children in the UK snore – and for around 2 to 3 per cent the snoring is a symptom of a more serious condition called obstructive sleep apnoea, the medical name for a pause in breathing while sleeping due to obstruction of the airways, preventing air from travelling to and from the lungs. Worryingly, obstructive sleep apnoea often goes undiagnosed or the diagnosis is delayed. Symptoms include loud snoring and snorting, pauses in breathing and daytime sleepiness, and concentration problems. The drop in oxygen saturation levels can lead to health problems, such as poor growth, delayed development, behavioural problems, impaired academic performance and reduced concentration. Obstructive sleep apnoea in children can have several causes – but around 80 per cent of cases are due to large tonsils or adenoids which narrow the airways. Tonsils are two small glands behind the tongue and adenoids are small lumps of tissue at the back of the nose. Both enlarge between the age of three and five, but start to shrink by age seven. Other conditions that carry an increased risk for obstructive sleep apnoea include children with structural abnormalities of the airways, Downs Syndrome, and increasingly – obesity. Treatment options include removal of the tonsils and adenoids, nasal drops that shrink the tiny blood vessels in the lining of the nose, inhaled nasal steroids, losing weight (if the child is overweight) or wearing a CPAP mask overnight to keep their airways open. 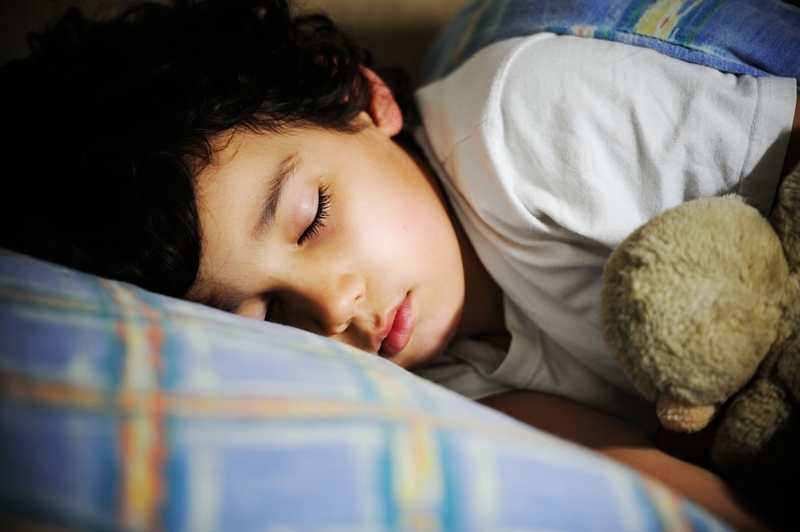 Seeing a respiratory consultant about your child’s sleep disorder is a simple enough process: it’s an opportunity to step back and assess your child’s sleep patterns and work out if it is caused by difficulty in breathing at night. An overnight sleep test may need to be arranged to monitor your child’s breathing at night and oxygen and carbon dioxide levels. We know that there are many factors that can bring about a respiratory-related problem, from your household environment to assorted ailments: my job will be to go through the checklist of potential reasons for your child’s poor breathing, advise remedies and put your mind at rest.